Above: A schematic illustrating initial layout of the test range near Tyuratam. On January 12, 1955, the chief of the Tyuratam junction, Anatoly Lebedev received a telegram directing him to detach two cars from a Tashkent-bound train. (18) This train brought the first military construction crew led by Lieutenant Igor Denezhkin from the 130th Directorate of Engineering Works (130 UIR). 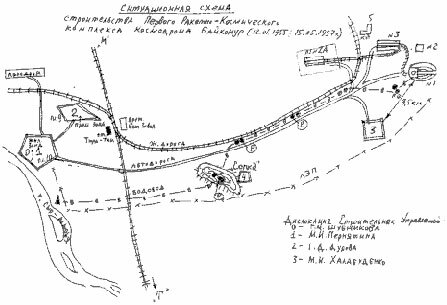 Denezhkin had an order to start preparing the construction sites for the sidings, which would receive special command train and cars with cargo for the construction. The "pioneers" found accommodation in the station's buildings and army tents. Almost entire January and February severe snowstorms prevented any significant construction activities. Nevertheless during this time, soldiers cutout several thousands cubic meters of ice from the nearby Syr Darya River and covering it with sawdust created a natural storage, which would save food next summer. At the end of March 1955, trains with construction crews started arriving. On April 10, 1955, the chief of construction Shubnikov and his directorate arrived in Tyuratam. By the end of May, all three brigades assigned to the project and headed by Permyatin, Durov and Khalabudenko were deployed at the site. The small train station in Tyuratam was avalanched with trains carrying people and materials for the construction. Since no warehouses existed, the unloaded cargo formed "walls" on both sides of the railroad near Tyuratam. (18) Tyuratam-bound trains also jammed adjacent stations. Only by the end of May 1955, the traffic could be cleared with the completion of a siding in Tyuratam. At the same time, a concrete-producing plant was completed on the opposite side from the railroad station building in Tyuratam. On May 5, the housing construction started at the Site 10 with the foundation of the first temporary wooden building by Permyatin's crew, which was intended for military headquarters. 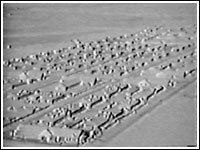 Despite terrible living conditions of the military personnel, the active construction of permanent housing for the range personnel had not started until 1956. (51) Soldiers and officers of engineering units had to survive for months in dugouts and tents. During 1955, huge dugout "towns" sprawled near the Tyuratam station and along the Syr Darya River. Anti-epidemic service headed by A.L. Pinskiy had to involve every soldier into large-scale operations of anti-rodent spraying over surrounding steppe to minimize the risk of cholera, plague and typhus. Only in April of 1955, "laundry crew" arrived in Tyuratam, and sometimes later -- a special laundry train, lavatory tanks, sewage systems and the cars with disinfecting showers to fight fleas. 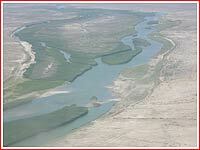 The range administration also organized the supply of meat from the cattle farms stretched along the Syr Darya River. Finally, every construction battalion was ordered to start a garden and a pig farm. In June 1955, the construction of the large assembly building started at the Site 2. On June 25, Durov's crew started development of the industrial zone at the Site 9. By the end of July 1955, more than three thousand military construction workers were erecting facilities around Tyuratam (according to another source: 5,000 workers). In July 1955, a communication link between Tyuratam and supply bases in Moscow and Tashkent had been established. At the end of the same month, a survey team from Moscow hammered markers into the ground around the future launch pad; the excavations, however, could not be started until September 15, 1955. On August 18, 1955, the 217th separate engineering and mining battalion (217 OISB) arrived to Tyuratam station by train from Semipalatinsk nuclear range. As its commander Sergei Alekseenko remembers (51) in an hour after arrival, he and his personnel boarded trucks and traveled for about two and half hours into the steppe, where they were dropped and left only with their backpacks and one-day rations of water and food. When trucks, which dropped them in the desert disappeared beyond the horizon, the arrivals saw no trace of life anywhere their sight could reach. Soldiers slept right on the ground using their coats as blankets. Yet, Alekseenko tried to convince his personnel that they are still better of here than in Semipalatinsk, where they had to endure similar "landings" several times a year, plus exposure to radiation from nuclear tests. "Look," he remembers saying, "this is more like a resort: no work plans, no bosses, and, what's most important, no barbwire fences, no mine fields. Complete freedom." Only on a third day of the "freedom," when the soldiers already exhausted their rations of water and food, the trucks reappeared bringing water, food, and mats for mattresses and anti-rodent chemicals. Alekseenko brigade landed just 3.5 kilometers south of the future R-7 launch complex, the most crucial construction zone in the Tyuratam project. The soldiers of the brigade spent about a week disinfecting the area around yet-to-be-built launch complex. By September 1955, Alekseenko brigade joined other engineering units erecting major facilities of the missile range. Excavations for the R-7 launch complex started the same month. In addition to a rail way and hard-surface automobile road, the construction of a power line and a water line from Syr Darya shore to the launch complex have started. To supply water to the launch pad, the pump station and two 500-cubical-meter water reservoirs were founded on a dominating hill, just north of Tyuratam. A pair of 1,000-cubical-meter reservoirs and a pair of 3,000-cubical-meter reservoirs were built farther north along the road to the launch complex, and, finally, three 3,000-cubical-meter underground water tanks were built just south of the launch pad. Aerial view of a military settlement near Tyuratam soon after its foundation. The original meteorological station in Baikonur circa 1956.